In the early months of 2011, after the HP Pre3, Veer, and TouchPad had been announced at HP's Think Beyond event in February, there were many debates raging inside the halls of the webOS campus in Sunnyvale. Decisions had to be made, projects were going to have to be cut or pushed onto the back burner. Those three devices weren't the only new webOS hardware coming from HP, it was just the first new webOS hardware that was to come from HP. A smaller webOS tablet, the 7-inch TouchPad Go, was planned for release a few months after the 9.7-inch TouchPad. A Bluetooth audio-equipped Touchstone wireless charger was being tested. The next generation of TouchPads was under development, including models that were thinner, had better screens, and more powerful internals. There was even a model equipped with a full-size slide-out keyboard in the labs, though the likelihood of it ever seeing the light of day was questionable. But those were further away, projects planned for a time when webOS was flourishing in the marketplace. It's still early 2011, and as enthusiastic as HP's leadership was formerly in the form of CEO Mark Hurd and still is in the form of Personal System Group (and former Palm CEO) Todd Bradley, the crew in Sunnyvale wasn't getting the financial and personnel support needed from HP HQ in Palo Alto to push everything out the door in the quality it needed to be in on the timeframe they wanted to hit. Hurd's replacement, former SAP chief executive Leo Apotheker and HP CFO Cathie Lesjak, aren't as enthusiastic about investing the billions of dollars needed to get webOS running at full steam. With limited funding available to get the work done, tough decisions have to be made in the webOS Global Business Unit. Sitting after the all-but-done TouchPad Go but before the fancier next-generation TouchPads is a curious webOS smartphone. It shares much of its internals with the HP Pre3 and bears the hallmarks of the clean and simple webOS hardware design language, but it's an entirely different beast. This is the WindsorNot, the webOS slate smartphone that never was. The debate comes down to a decision by webOS Senior Vice President Jon Rubinstein. He had joined Palm back in 2007 as Chairman, and while Ed Colligan remained on as CEO, it was very clearly Rubinstein's show. He came into Palm and found a dozen development projects running concurrently in a company that was spinning its wheels in the creation of its much-needed next generation operating system. Rubinstein promptly canned several devices, including the ill-conceived Palm Foleo smartphone companion. After launching the Pre, Pixi, Pre Plus, and Pixi Plus smartphones, Rubinstein became Palm's CEO and eventually guided the floundering company into the embrace of HP. Rubinstein's been with Palm for four years at this point. He's been making decisions on where to best allocate limited resources for nearly that long. Joining HP was supposed to solve that problem, but when things went south when the machinations of corporate games began to surface, Rubinstein again had to exercise the axe. In early 2011, the TouchPad, Veer, and Pre3 were the only new webOS devices that had been launched. The Veer was close to launch, while the TouchPad was projected for late June or early July and the Pre3 for later in the summer. The WindsorNot (a development codename and inside joke all-in-one stemming from being a follow-up to a previously-cancelled webOS slate smartphone codenamed "Windsor") was to follow the Pre3 later in 2011. Faced with the limited resources at his disposal, Rubinstein has to chose which device has to be pushed to the back burner: the Pre3 or the WindsorNot. On the side of the Pre3 is that it runs webOS 2.x and won't require extensive software work to be a functioning phone. It's also already been announced, and is the bigger-screen portrait slider smartphone that webOS fans have been loudly clamoring over for years now. The WindsorNot, on the other hand, is intended to run webOS 3.x, which while retaining the built-for-phones core of webOS, was rebuilt for tablet use on the TouchPad. In essence, the smartphone OS was stretched and pulled to fit the big screen TouchPad, and now it has to been squeezed and stuff back onto the smaller WindsorNot. The Pre3 has another bullet in the chamber: it has commitments from both AT&T and Verizon. The WindsorNot has AT&T's backing, but they're not as enthusiastic about it as they are the Pre3. AT&T already has a healthy stable of slate smartphones from the iPhone lineup to several Android-powered smartphones. Their physical QWERTY offerings are limited though, and the Pre3 promises to be a significantly better device than the aging BlackBerry smartphones on their shelves, not to mention it comes from a huge and stable Silicon Valley titan like HP and not the stumbling and bumbling Research in Motion of 2011. AT&T has another qualm with the WindsorNot: it doesn't have LTE, and they’ve set the cut-off date for new phones on their network without the real 4G at the end of 2011. Faced with these facts: the Pre3 is closer to launching, has the eye of the press and fans, and commitments from two major US carriers, while the WindsorNot is going to require even more investment and rushed development to be ready for release by the end of the year onto a carrier that's not as enthusiastic, Rubinstein's decision seems all but obvious. He chooses to dedicate funds to the development of the Pre3. While the decision was framed as prioritizing the launch of the Pre3 before the WindsorNot, it had the effect of killing the slate smartphone. By pushing back the release timeframe for the WindsorNot, the phone was suddenly looking at availability starting in 2012, past AT&T's deadline. AT&T had been investing heavily in their LTE network and was eager to start moving customers onto it; launching a smartphone with LTE in 2012 was not going to happen. That's where the WindsorNot ended. Hardware development on the WindsorNot was still ongoing, though software development had not proceeded very far. We recently got our hands onto one of the few WindsorNot prototypes in the wild and it's been a very potent burst of nostalgia. When we say that the WindsorNot shares a lot of its internals with the Pre3, we're not kidding in any sense. 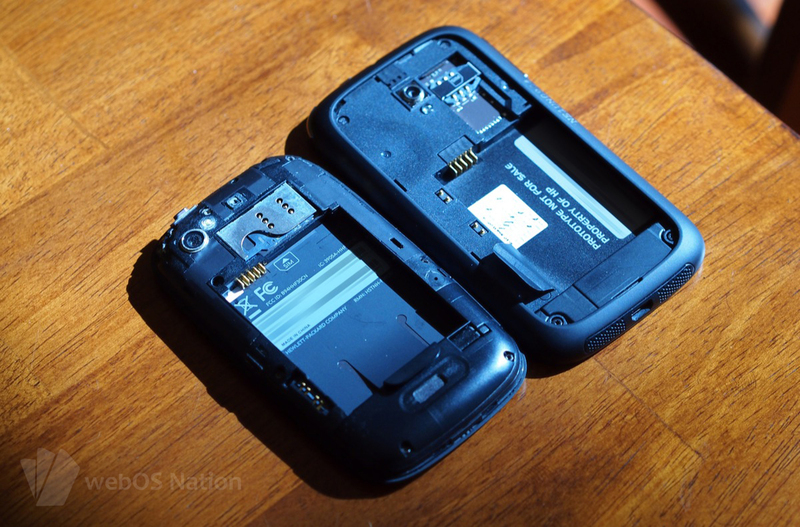 HP was testing multiple hardware configurations to determine the best suppliers for the smartphone, so the WindsorNot we have has a sticker on the inside of the battery compartment that checks off the components inside. Ours has the same 1.4GHz Qualcomm processor as in the Pre3, RAM manufactured by Micron, and 8GB of storage. The battery is exactly the same as the Pre3's and by all appearances the two smartphones share front and rear camera assemblies. No doubt if we were to crack open both smartphones we'd find even more parts in common, but given the relative rarity of the Pre3 and the leprechaun-riding-a-unicorn rarity of the WindsorNot, that's not something we're keen on doing any time soon. Like the Pre3, the WindsorNot also has an 800x480 LCD screen, though in this case it's a 4-inch screen instead of the 3.65-inch screen on the Pre3. While that means it technically has a lower pixel density (255ppi vs. 233ppi), we frankly couldn't tell much of a difference. They've both got decent screens, though in this day and age, anything under 300ppi isn't anything to write home about. When we say that the development of software for the WindsorNot had not progressed very far, we mean it. From all appearances, the unit we've been handling appears to run a nearly visually unaltered version of webOS 3.x as it would have been on a TouchPad tablet. As the WindsorNot's screen is much more pixel dense - 233ppi to the TouchPad's 132ppi - the unaltered user interface elements like text and the menu bar appear exceedingly small on the 4-inch screen. Because the WindsorNot is a prototype device, activating it on HP's production servers is something that's simply not going to happen. With a device as rare as this one, with nary a webOS Doctor in sight to perform a restore should our tinkering go foul, we were apprehensive about making command line alterations with the goal of tricking HP's servers into activating the device. Even though the WindsorNot shares a good deal of its internals with the Pre3, a it was a device intended to run webOS 3.x and not webOS 2.x, there are notable differences between the two smartphones. Where the Pre3 has a physical keyboard in the form of a portrait slider and a gesture area, the WindsorNot is a pure slate device and eschews the traditional webOS smartphone gesture area in favor of a TouchPad-style rounded-rectangle home button with embedded light bar. Without the physical keyboard weighing it down, the WindsorNot is quite literally not as weighed down as its portly sibling. The trade-off of a portrait slider like the Pre3 comes as thickness and weight. Indeed, the Pre3 is several millimeters thicker than the WindsorNot, as well as a noticeable few ounces heavier. In comparison to the device the WindsorNot was designed to target - Apple's iPhone 4 - the webOS slate smartphone is lighter, marginally thicker, and has a larger footprint thanks to its 4-inch display. While from the front the WindsorNot looks like the lovechild of a Pre3 and a TouchPad, when you flip it over things start to get different. The soft-touch sides gently slope back from a narrow chamfer around the screen, coming about a centimeter in from the edge before transitioning to a flat and glossy black back panel. A camera sits high and center on the back with a single LED flash below (or to the side, if you're taking pictures in the ever-popular landscape orientation). Just above the center of the back is HP's logo, though it's in a sort of dark chrome and under the plastic so as to avoid the terrible scratching that the round-backed Pre3's appliqué logo endured. And yes, you read that right, it's a plastic panel. There's a notch on the bottom in which you stick a fingernail to pry off the back. It's held in by a handful of tabs around the frame. While we're not huge fans of tabs like this when it comes to removal, they're one of the tradeoffs that have to be made for a clean design like this. Additionally, the plastic back is one of the most insane fingerprint magnets we've dealt with in our time covering webOS, and that's including the insanely glossy original Palm Pre back. The front glass is also a fingerprint magnet and seriously difficult to keep clean, though given this device's prototype status we wouldn't at all be surprised to find that it hasn't been treated with the usual cocktail of chemicals to make our prints and facial grease stick with less vigor. So you'll have to forgive and smudges, streaks, fine hairs, or dust that show up in these photos. We tried. The bottom of the WindsorNot features two speaker grilles flanking a solitary Micro USB port. It's likely that only one of the grilles houses an actual speaker. Judging by the lack of a dedicated microphone hole on the front or elsewhere on the bottom of the device, the phone microphone is likely located under the other part of the perforated plastic. The left side is home to a dark chrome volume rocker and the right side is barren of any inputs or controls. The top of the WindsorNot is just about the busiest portion of the device. Starting at the top left corner you'll find a pinhole for the secondary microphone, and in the center is a headphone jack, and though the hole is slanted, just as with the Pre3's angled opening it's not recessed like the ill-considered headphone jack on the original iPhone. It's hard to say if there's any Beats magic at work here, but considering the similarities to the Pre3 we'd wager it's not. Sitting between the headphone jack and the top right corner is the classic Palm ringer switch. On this prototype WindsorNot the ringer switch moves with a highly satisfying click. Interestingly, the finish of the indicator surfaces inside the switch are a brighter metallic gray with an orange dot for off instead of the black finish and orange dot of older webOS devices. Rounding out the tour of the top is the power button. Like every other webOS device, you're supposed to push it to turn it on and turn it off. Except that on this specimen of the WindsorNot the power button was unresponsive for waking the device. That could only be accomplished by pressing the home button. In fact, half the time the power button was pressed while the device was on, it would crash. Again, we never got past the account set-up screen, and if it's crashing there, you know there's work to be done on the software. Boot times were about in line with what we would expect for a single core webOS device. And by that, we mean it is slow, taking over three minutes to get us back to the account set-up screen. More than once the WindsorNot crashed hard, rebooting into a mode we've frankly never encountered in years of tinkering: "entering main console loop" with the image of a glowing 5-1/4-inch floppy disc on the screen. When you get a 5-1/4" floppy disc from Tron you know you've done something wrong. The knowing minds that would know what this sort of thing means were likewise stumped, though eventually through a combination of battery pulls and restarts we were able to get back to the account set-up screens instead. So yes, the WindsorNot as it stood at the time of cancellation was not a paragon of stability. But it was already a lower-priority project and still several months from its planned release. Even so, a lot of webOS 3.x did transfer effectively to the smaller screen. As was demonstrated with the webOS emulator shortly before the TouchPad's release, webOS 3.x already had some considerations for smaller screens built-in. The virtual keyboard that's available on the WindsorNot is actually pretty decent so long as you consider that it, the touchscreen driver, and everything else going on with the WindsorNot's software was nowhere near optimized. Even so, the keyboard has been reconfigured nicely for the 4-inch screen. It drops the dedicated button row of the tablet to a more traditional numbers and symbols page. Keys where special characters would be available can be triggered by a long press, just as on the TouchPad. And the keyboard even stretches comfortably when the phone is rotated into landscape mode. It occasionally would miss taps or interpret a tap as a hold, but again, this is preproduction software and hardware at work. As revealed in the code spelunking of the WebOS Ports crew, there were grander plans for the phone-sized webOS virtual keyboard. It's easy to look at the WindsorNot and imagine what could have been. It also too easy to have a knee-jerk reaction and blame its cancellation on Leo Apotheker. After all, it was his decision making that put webOS into a death spiral that resulted in it being saved by a migration to open source and a purchase by LG for televisions. It's also easy to blame the corporate workings of a massive company like HP for failing Palm and forcing the WindsorNot into an early cancellation. But HP's a company that had priorities other than just getting into mobile, and they were already committed for two smartphones and a tablet in the next few months, with other devices coming down the pike for impending releases. With deadlines and funding peaking over one shoulder and an ambivalent carrier looking over the other, the WindsorNot's fate was decided before it had a chance to get proper software or a name. The WindsorNot is an object of gadget lust, for an operating system led and forced down the wrong paths by a confluence of events and persons so preposterous it still flabbergasts. It's a symbol of a lack of corporate oversight and warped vision. Most of all, the WindsorNot, more than any other unreleased piece of webOS hardware we've laid our hands on, is a stark display of what could have been. The TouchPad Go was merely a miniature TouchPad. The WindsorNot was something more ambitious. It was uncharted territory for webOS - the last Palm handheld without a physical keyboard was 2005's Lifedrive PDA. It was the next step in the evolution of webOS 3.x, and a gambit to move webOS smartphones into the same space of consideration as Android and iPhone. But in the end, it was none of those things. The WindsorNot never stood a chance of making outside the doors of the webOS campus in Sunnyvale. Too many factors conspired to keep this device out of the hands of customers new and old. The WindsorNot isn't just the webOS slate smartphone that never was. It's the webOS slate smartphone that was never meant to be.